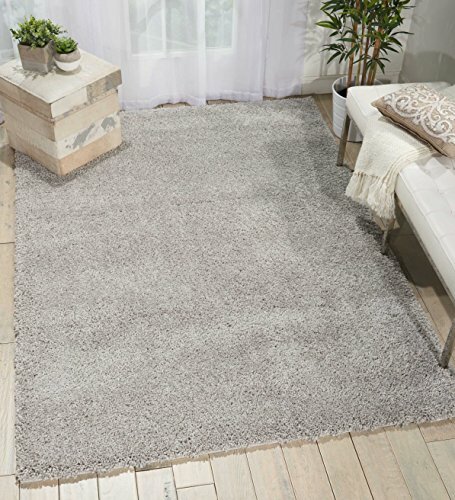 Made from the finest polypropylene, this modern Malibu shag rug by Nourison is the softest you’ve ever set foot on – as well as an astounding value. From the moment your feet sink into its plush, luxurious 2” piling for the first time, you’ll realize that you’ve never felt more comfortable walking in your own home. Choose from a variety of contemporary solid colors – blue, cream, dark grey, ivory, navy, silver grey, and slate – and designs - including area rugs, round rugs, runner rugs, and California rugs – as well as many different sizes to find the perfect shag rug to complement your entryway, bedroom, living room, dining room, home office, or kitchen. Though this rug is thick and soft to the touch, it’s also easy to clean and keep beautiful for years to come – simply vacuum out dust and dirt, or spot clean using basic carpet cleaning solutions if needed. Its thick, sturdy construction ensures that it won’t shed fibers, thin out, or lose its eye-catching appearance, giving you an enjoyable, lustrous conversation piece you, your family, and your friends are guaranteed to love. Nourison is an industry leader in the world of rugs and floor coverings. We offer a broad, diverse catalog of items in a variety of cuts, shapes, and sizes designed to fit comfortably - and look great - in any environment. Our products, ranging from our signature handmade area rugs to our high-end offerings, such as our prestigious Timeless collection, are recognized and celebrated by owners worldwide for their beauty and craftsmanship - as well as their extraordinary value. We back all of our rugs with a 30-day money back guarantee. If for any reason you aren’t happy, simply let us know and we’ll help you find a perfect fit – or refund your purchase in full. A GORGEOUS, CONTEMPORARY SHAG RUG: Give your home an effortless modern touch with a super-soft, luxurious 100% polypropylene Malibu shag rug. The comfiest 2" pile shag rug on Amazon, guaranteed. FIND YOUR PERFECT COLOR: Available in striking contemporary blue, cream, dark grey, ivory, navy, silver grey, and slate, there's a perfect shag rug to match your decor. FIND YOUR PERFECT SIZE: Choose from area rugs, round rugs or runner rugs in a variety of sizes and find the perfect piece to complement your entryway, bedroom, living room, dining room or home office. NON-SHEDDING, EASY TO CLEAN AND MADE TO LAST: Your rug is designed to keep its eye-catching look and incredibly soft feel for years to come. All that's needed is simple vacuuming or spot cleaning. YOU'RE GUARANTEED TO LOVE IT: 30-day money-back customer satisfaction guarantee. If you don't completely love your rug, we'll help you find a better fit for your needs - or your money back.